The 18 days Uganda Rwanda gorilla safari is an active adventure that entails the water adventures of the Nile at Jinja, Murchison falls National Park encounter, the Chimpanzee trekking experience in Kibale National Park, the adventure of the mountains of the moon – Ruwenzori mountain climbing, Gorilla tracking in Volcanoes National Park – Rwanda and the Kigali city experience. The trip is comprehensive and designed to fit every ones’ expectations. Day 1 of the 18 days Rwanda Uganda gorilla tracking safari: Arrive in Uganda – Entebbe Airport. 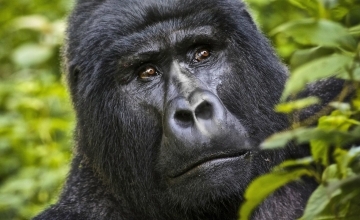 Day 5 of the 18 days Rwanda Uganda gorilla tracking safari: Drive to Kibale National Park. 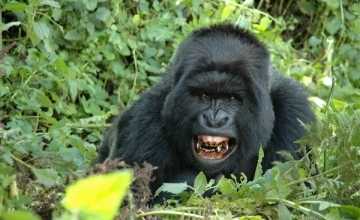 Day 6 of the 18 days Rwanda Uganda gorilla tracking safari: Do Chimp trekking & transfer to Kasese. 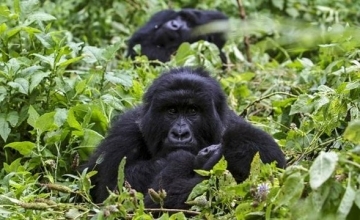 Day 7, 8, 9, 10, 11, 12, 13 & 14 of the 18 days Rwanda Uganda gorilla tracking safari: Climb Rwenzori Mountains – the historic mountains of the moon. Day 15 of the 18 days Rwanda Uganda gorilla tracking safari: Drive to Lake Bunyonyi. Day 18 of the 18 days Rwanda Uganda gorilla tracking safari: Drive to Kigali – Rwanda. Arrive in Uganda from your country of origin. You will find our courteous guide zealously waiting for you to take you through the wonders of the 17 days Uganda Rwanda Safari. Upon arrival, you will have a brief introduction about the safari and the general overview of the situation in Uganda and Rwanda after which you will be transferred to your hotel. Accommodation: Cassia lodge (Midrange/standard), The Lodge (Budget/basic) or Sheraton Hotel (Luxury/upmarket). Wake up very early to transfer to Jinja the source of the longest River in the world – River Nile 117km about 2 hours’ drive. Do some water rafting, bungee jumping and encounter the source of the Nile on a cozy boat ride. You will have lunch in Jinja and return to Kampala in the evening. Accommodation: Spend a night at your previous hotel. Day 3 of the 18 days Rwanda Uganda gorilla tracking safari: Drive to Murchison Falls National Park & visit Ziwa en route. Drive to Murchison Falls National Park 348km about 6 hours’ drive from Entebbe. You will branch off at Nakitoma to Ziwa Rhino Sanctuary about 175km from Kampala. Continue with the journey to Masindi for lunch and proceed to the park to visit the top of the falls. Accommodation: Murchison River lodge (Midrange/standard), Red Chili Rest Camp (Budget/basic) or Paraa Safari Lodge (Luxury/upmarket). Wake up early enough to catch up with the ferry crossing at 07:00am to the northern side where you will be able to do game drive. You will be able to spot a range of game including; Giraffes, Jackson Hartebeest, Lions, Buffalo, elephant, Uganda Kobs, among other species. Return from this activity at 11:00am and relax at the lodge till lunch time after which you draw closer to Paraa to catch up with the Nile boat cruise at 03:00pm. On this boat ride, you will enjoy sights of Nile crocodiles, Hippos, water birds and other dwellers including the rare shoebill stork. Many animals are also seen drinking on the river side. Accommodation: Spend an overnight at your previous lodge. 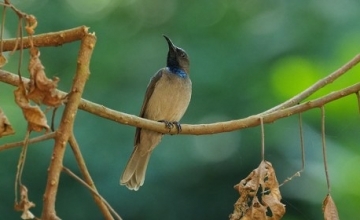 After breakfast, embark on the drive to Kibale national park 441km about 9 hours’ drive through the lush country side and magical scenery of the western rift valley plus the Rwenzori Mountains before arriving in Fort Portal and Kibale in the evening. Accommodation: Primate Lodge (Luxury/upmarket), Chimps nest (Midrange/standard) or CVK resort (Basic/budget). 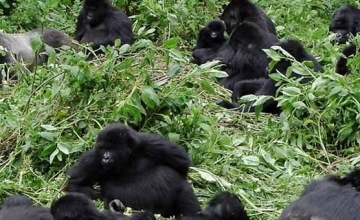 Day 6 of the 18 days Rwanda Uganda gorilla tracking safari: Do Chimp trekking & transfer to Kibale National Park. After breakfast, gather at Kanyanchu tourism center for briefing about the Chimpanzee trekking activity at 08:00 am. Set off to the forest of Kibale full of birds, 13 primate species of which chimpanzee is among and other remarkable fauna. The activity takes over 2 – 5 hours and one hour is available for you to interact with Chimps and take photos. Afternoon, embark on your journey to transfer to Kasese 110km about 3 hours of drive. Arrive in the early evening for relaxation and overnight. Accommodation: Equator Snow Lodge (Luxury/upmarket), Ruboni Community Camp (Basic/budget) or Mihunga safari Lodge (Midrange/standard). Wake up for an early breakfast after which you will transfer to Ibanda – the park Headquarters and the logistics support center at Ruwenzori Mountaineering Services. Equipment, porters and guides are gathered at this point so as to gain momentum for this 8 day active adventure. Hike up to Nyabitaba hut over 5 – 7 hours. Wake up early enough to embark on the 7 hour hike from Nyabitaba hut to Kurt Shaffer Bridge across Bujuku and Mubuku rivers. It’s quite steep and slippery here. Proceed to John Matte hut to rest your day. Embark on this 3 -5 hour hike from John Matte across Bujuku River before penetrating Bigo bog where you will then ascend on dry surface to Lake Bujuku. Mt Baker and Mt Speke appearing in the north, you will maintain your trail until you rest your day at Bujuku hut. Hike from Bujuku hut to Scott Elliot stretching to Elena hut which is the end point of the central circuit. The Margarita peak climb commences from here over 5,109m which requires two extra days. From Elena hut, descend via sparse vegetation that characterizes the Alpine zone up to Lake Kitandara hut for overnight. Start from Lake Kitandara hut and descend amidst sights of Democratic Republic of Congo and Margarita peak northwards. Arrive at Guy Yeoman hut for overnight. After an early breakfast, embark on the downward movement for over 5 hours up to Nyabitaba hut. You will relax and spend an overnight here. 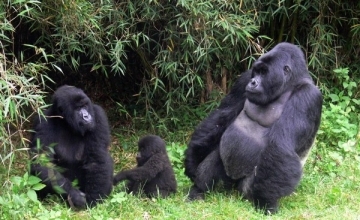 Day 13 of the 18 days Rwanda Uganda gorilla tracking safari: Descend from Nyabitaba hut to Nyakalengija. 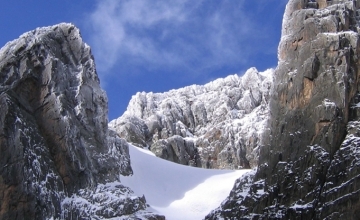 This is the final descend of this active Ruwenzori hiking adventure. You will descend for over 3 hours before arriving at Nyakalengija Park headquarters to mark the end of your adventure. You will be transferred to your hotel for relaxation and overnight. Since hiking Rwenzori Mountains is not an easy activity, you need a whole day of rest doing passive activities like swimming and allowing the body to rejuvenate. Accommodation: Spend an overnight at your previous Hotel. After breakfast, embark on the transfer to Lake Bunyonyi 311km about 6 hours’ drive. You will pass through the unpaid game sights in Queen Elizabeth National Park and the amazing scenic views of Kigezi Highlands. You will arrive in the afternoon for relaxation on the shores of the waters of Lake Bunyonyi which is the second deepest lake in Africa after Lake Tanganyika. Accommodation: Mountain Gorilla View Hotel (Upmarket/luxury), Lapalme Hotel (Midrange/standard) or Muhabura Hotel (Budget/basic). As it has been dubbed the land of a thousand islands, Lake Bunyonyi has 29 islands which can be explored on boat. These islands are surrounded by the magical Kigezi highlands whose terrain and the level of their temperature has justified them as the Switzerland of Africa. The 5 – 6 hour boat ride offers you impressive views of the Lake flora, bird species on the shores, clear waters of Bunyonyi alongside the community encounters exploring into the Bakiga and Batwa traditions. 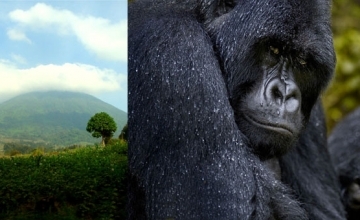 Upon returning from this activity, you will embark on the transfer to Volcanoes National park 120km amidst the great scenic views of Virunga ranges before arriving for dinner and overnight. Accommodation: Mount Gorilla View Lodge (Upmarket/Luxury), Hotel La Palme (Midrange/Standard) or Muhabura Hotel (Budget/Basic). Gather at the Park headquarters at Kinigi after breakfast at your hotel. At 08:00am briefing will start to help you gain insight about the day’s activity by the park warden and then you will be divided and allocated gorilla families to track. 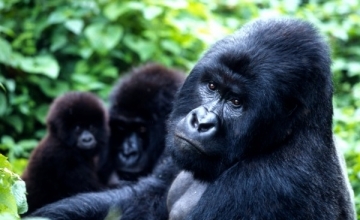 Set off to the jungle of Volcanoes in search of mountain gorillas which takes over 2 –8 hours. Encounter gorillas for one hour and you are free to take photos provided the flash is off and ask questions to the guide regarding these gorillas. Return from this activity. Relax after which you can visit the Iby’wachu village to explore the Banyarwanda culture or take a nature walk to the twin lakes. Embark on your 116 km journey over 3 hours’ drive to Kigali city after an early breakfast. You will reach in Kigali early enough and embark on Kigali city tour. On this tour, you will see the Kigali Genocide memorial site, the Nyamata church, the Presidential Palace Museum and the general Kigali landscape before preparing for your departure. Mountain Gorilla View Lodge: This accommodation facility extends value for money and the magnificent sights of the Volcanoes national park. It is positioned on the lower gradients of Sabyinyo Mountain. Gorilla view lodge contains 30 private stone cottages with modern furnishing and décor. With a fire place and en suite facilities, the lodge is worth of stay while at Gorilla tracking safari in Rwanda. La Palme Hotel: With 48 fully furnished rooms with 4 big elegantly designed suites, La Palme Hotel counts among the cozy and ultimate safari accommodations within the environs of Volcanoes national park. Rooms have Wi-Fi, Satellite TV, 24 hour room service, telephone and double beds. Nyungwe Forest Lodge: The lodge is found on the edge of Nyungwe forest and it has 24 luxury rooms the 2 being suites providing tourists with comfortable sleeps while on their safaris in Rwanda. The lodge has a swimming pool, lounge, bar, fire place, en suite facilities, restaurant, laundry services, internet access, Air conditioner and so many other services provided to Rwanda safari tourists. Muhabura Guest House: Muhabura hotel is a budget accommodation found opposite musanze headquarters near the bank of Kigali. This exposes you to a comfortable life while you stay away your home. There are 30 rooms with single, double and Twin. The rooms are self-contained, with warm and cold showers, satellite TV, laundry services, balcony, garden and so many others. La Palme Hotel: This is among the best deluxe hotel in Rwanda where tourists always feel comfortable to stay while o their Rwanda safaris. This hotel has 48 well designed rooms with 4 large suites. The rooms have screens, good services, internet access, Double bed, telephone and are self-contained. Professional English Speaking driver guide. Any other foreign language speaking guide can be arranged on request.